Kaitlyn Jesionowski, a first-year UCF student, recounts her experience as a Parkland shooting survivor and shares how she’s forged the road to recovery. Kaitlyn Jesionowski says talking about the tragedy she witnessed at Marjory Stoneman Douglas High School nearly a year ago makes things a little bit easier. Bullets from a semi-automatic rifle drilled into Room 1214 of Marjory Stoneman Douglas High School in Parkland, Florida, as dozens of students dove for cover in fear for their lives. As the shooting started on Feb. 14, 2018, Kaitlyn Jesionowski crouched behind a computer cart. It was the last time Jesionowski, now a UCF student, would see some of her classmates alive. It’s been almost one year since the shooting killed 17 students and faculty and injured 17 others. The survivors are rebuilding their lives as they recover from the tragedy. Jesionowski, 18, a first-year nursing-pending major, says she has woven together a support system of friends and family who helped her cope with the shooting. Talking about it makes things a little bit easier, she says. After the shooting, Jesionowski raised her shaking hands and ran down the hallway that was smeared with blood and littered with bullets and broken glass. And later on, Jesionowski ran — to recover. To cope with grief and begin healing, she threw herself into her hobbies: running, working out, dancing. Jesionowski, who was a member of her high school’s track team, says running has helped her cope, but she still carries the trauma of the shooting with her every day. She also occupied herself with Irish dancing, though she said the loud clacking sounds of the hard shoes — reminiscent of the deafening pops of a rifle — made it a difficult hobby to go back to. “Everywhere I go, I have to see where the exit is if something happens and kind of make a plan,” she says. However, Jesionowski says, the shooting has eventually shaped her for the better, strengthening and improving her outlook on life. 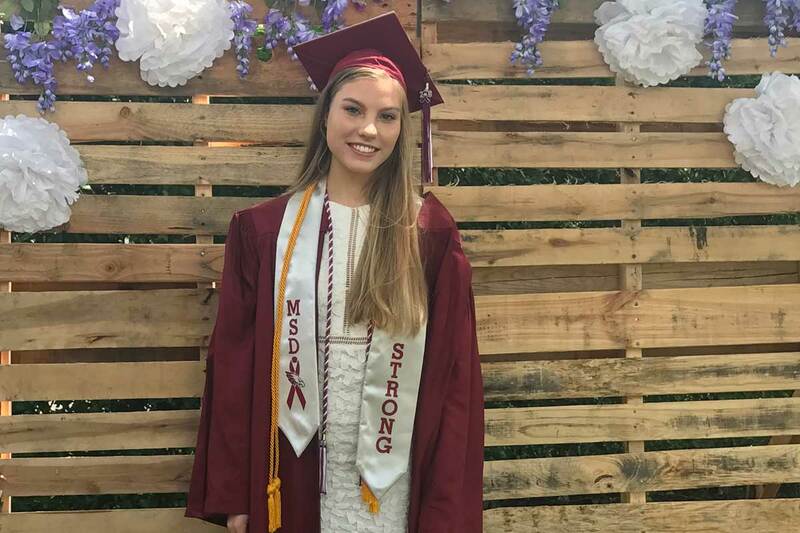 Kaitlyn Jesionowski, who graduated from Marjory Stoneman Douglas last year, says she’s going home to Parkland to be with family for the one-year anniversary of the shooting. It was good to move away from home and come to UCF, Jesionowski says, adding that everything for her was too focused on Marjory Stoneman Douglas. But she still has two younger sisters who attend the high school. “I definitely worry about [my sisters] … But also my entire family, wherever they go, like a shopping mall. [A shooting] could happen there,” she says. The massacre in Parkland created a national conversation, sparked by a group of outspoken students calling for stricter gun-control laws. Also, filmmaker Charlie Minn directed the documentary Parkland: Inside Building 12, which centers on the stories of the survivors and victims, including Jesionowski, and features raw crime-scene footage. The film played at a theater in Orlando in January. “[There were] just so many examples of heroism and humanity that were going on inside of the classrooms, and I don’t think those stories have really been brought out,” Minn says. Jesionowski arrived at UCF last fall and she says she’s forging a life focused on the future. She says she’s always thought she wanted to work in the medical field, but the shooting helped solidify that plan. “I think just helping people and being able to be there … [I] like connecting with patients more,” Jesionowski says. She plans to apply to UCF’s nursing program next year. Jesionowski says she’s going home to Parkland to be with family for the one-year anniversary of the shooting. She also encourages people not to live in fear, but to be cautious, prepared and appreciative every day. A candlelight vigil will be held on Memory Mall at 6 p.m. Feb. 14 to recognize the one-year anniversary of the mass shooting at Marjory Stoneman Douglas High School. In addition to the vigil, there will be remarks from UCF students who survived the incident as well as performances from the UCF Glee Club and local artists. 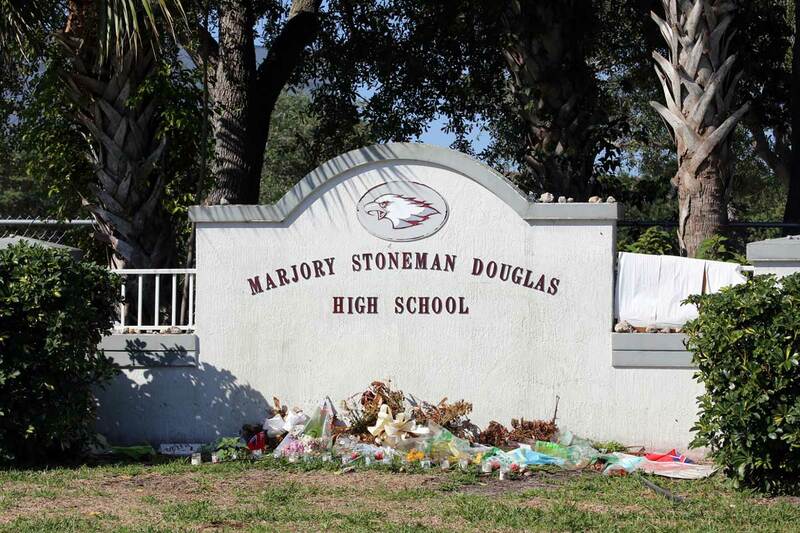 Located just three hours south of Orlando, Marjory Stoneman Douglas in Parkland, Florida, is one of UCF’s largest high school feeder schools. More than 400 former MSD students are currently enrolled at UCF, including nearly 70 first-time-in-college freshmen. The event is sponsored by UCF’s Student Government Association, the Alumni from Marjory Stoneman Douglas at UCF, Social Justice and Advocacy, the UCF Glee Club and March for Our Lives Orlando. CAPS, a free service for students enrolled at UCF, offers individual, group and crisis counseling, along with a variety of other programs. An after-hours crisis hotline can be reached at 407-823-2811. CAPS also offers online resources on trauma and coping with grief, among others. A support workshop at CAPS is being held on Feb. 14 at 4:30 p.m. for students impacted by the Marjory Stoneman Douglas shooting. Victim Services is a confidential victim-advocacy program for students who have been impacted by crime, violence or abuse. Crisis intervention is available 24/7 through UCF Victim Services, either in person, or by calling 407-823-1200 or texting 407-823-6868. Student Care Services guides students through stressful situations and offers resources and referrals. SCS can be reached at 407-823-5607. The online program provided by CAPS allows students to individually work through interactive modules, which are meant to help overcome anxiety and depression, at any time of the day from the comfort of their home.